The purpose of this run is to raise money for the LST 325 SHIP MEMORIAL, INC. The memorial made plans to return the LST to Normandy for the 70th D-day memorial service in 2014, and beach it at the same location where it was on Omaha beach 70 years before. Shortage of finances caused the 2014 trip to be cancelled. 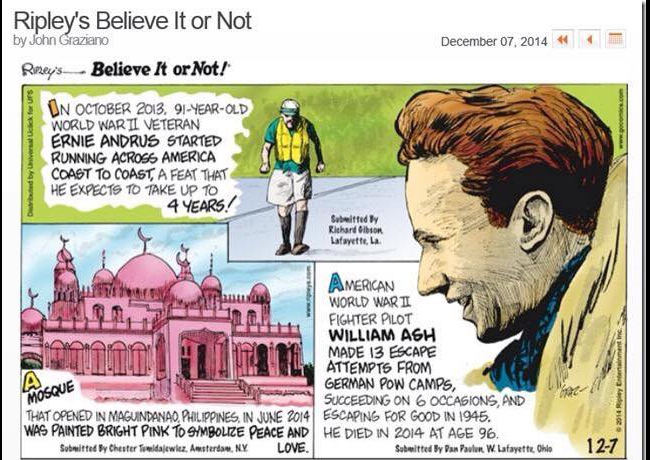 Perhaps, this run will raise enough money for 75th D-day memorial service in 2019. Ernie Andrus is the coast to coast runner. He started by touching the Pacific Ocean near San Diego, CA on Monday, October 7, 2013 (at the age of 90) and will touch the Alantic Ocean near Brunswick GA, two to four years later. Ernie plans on running 3 days a week averaging between a 1/2 marathon and a marathon a week. For any reason, he is not able to finish a run, he will go back and run it at another time. Ernie welcomes any runners who would like to join him on any leg of his journey. 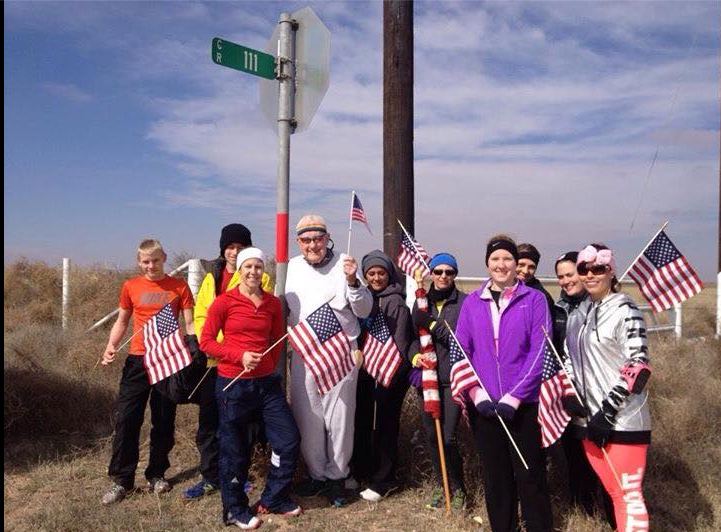 As of May 30, 2015 Ernie has ran 1,489.42 miles in 537 hours, 57 minutes & 36 seconds. Average pace 21:40. Average leg 6.13 miles. Average miles per week 18.39. The next run, tomorrow, June 8, 2015. Start at 7:00 AM at the Westview Baptist Church (Main and Thelma, Gatesville, Texas) runs through Gatesville. Ends at the first picnic area east of Gatesville on Hwy 84. Meet at the finish before 6:45 so we can leave a car there and take mine to the start. I'll run, you can walk, my pace is slow. The greatest run ever today. Today, June 6 is D-Day + 71 which means the LST 325 landed on Omaha beach at Normandy 71 years ago today. An enormous record breaker today. 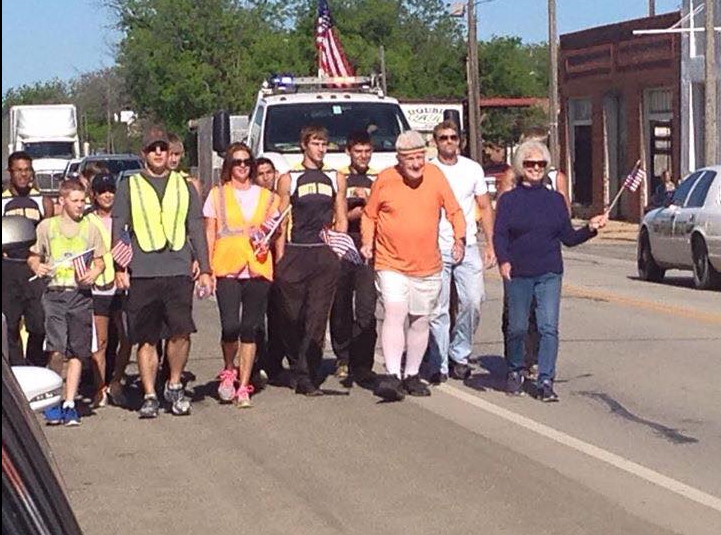 Had fifty runners a bab in arms a kid on a bike and three escorts as we ran into Gatesville, Texas. Went to a steak house for brunch where the RWB from Fort Hood presented me with a brand new pair of Brooks shoes and two visor hats. The support I'm getting from the Red White and Blue here in Texas is fantastic. A beautiful 7 mile run yesterday. The weather continues to be friendly. Had 8 runners a dog and 2 escorts on my support team. Looking forward to tomorrow's run, Saturday, June 6, 2015. This is a 5.55 mile run into Gatesville, TX and proves to be a record breaker. Parking space is limited so some are pooling cars. We will start at 7:00 AM at the Beall ranch and end at the Westview Baptist Church (Hwy. 84 and Thelma). If you plan to attend be at the church before 6:45. We will shuttle to the start and plan where to park cars. After the run we will go to a steak house for brunch where some presentations are planned, sponsored by the RWB. Everone welcome to attend. I AM EXCITED. The next run is Thursday, June 4, 2015. Start at 7:00 AM at the County Line Pizza, 11 miles west of Gatesville. Ends at the Beall ranch. About 7 miles. If you want to run along be at the start before 7:00. I'll run. You can walk, My pace is slow. Ernie was one of the crew that brought the LST 325 back from the Isle of Crete, Greece to the U.S. in 2000. It was aired on the history channel in 2001 as The Return of LST 325. Ernie and his ship mates restored the LST, and it still is operational. He is an active member within the national LST association, which currently has 9,000 members. He served as 3rd class petty officer and pharmacist mate 3rd class on the Pacific ocean during the WWII. He began running in the mid-1980’s when the Olympics were in Los Angles. He ran the Olympic Torch Bearer Run and he says that when he finished, he kept wanting to run. 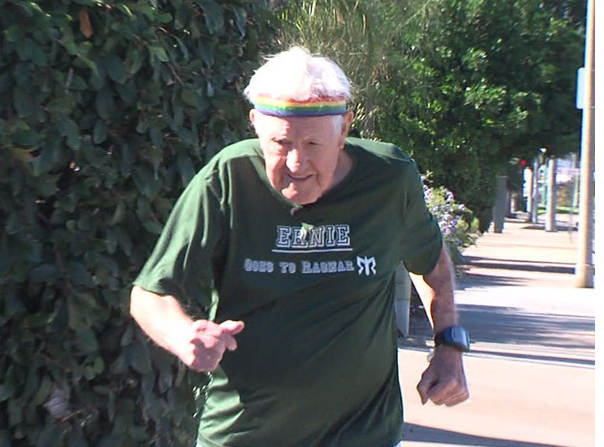 At the age of 86 and 88, he participated in the Whiskey Row Marathon which is a half marathon. “I always run in it, but usually I do the 10K”. If you have nothing to do and you’re looking to be a part of history, you can join in on a coast to coast run. LST 325 is a floating veteran, a steel memory that honors the World War II generation. Launched October 27, 1942, it was commissioned February 1, 1943. It served in the Mediterranean Theater and during The D-Day invasion of Normandy, engaged in artic operations in the 1950s and later sold to the Greek Navy, where it was L-144 (A/G Syros). Purchased by USS LST Ship Memorial Inc. in 2000, the ship sailed 6,500 miles from Crete to Mobile, AL, before traveling to Evansville IN where it is today. to bring the LST 325 back to Normandy for the 75th year anniversiry. Face Book -- Coast to Coast Run -- Get the latest posts here.